We will be moving the contents of the existing Faculty180 Knowledge Base (the platform's standard technical documentation) into the Interfolio Help Center. All the same articles will be there. We are simplifying the process for getting live support from Interfolio, and making some changes to the support ticket creation system. Again, these changes are planned for September 2017. It will make getting assistance and information simpler as the Interfolio faculty information system becomes more unified. If you have specific questions about how the transition will affect users at your institution, please let us know at clientsuccess@interfolio.com. Delete a single course and all its attachments, when given a course ID. Delete all courses taught for a given term, and this will delete by termids, users, or users for given termids. For more information, please reference our API documentation. 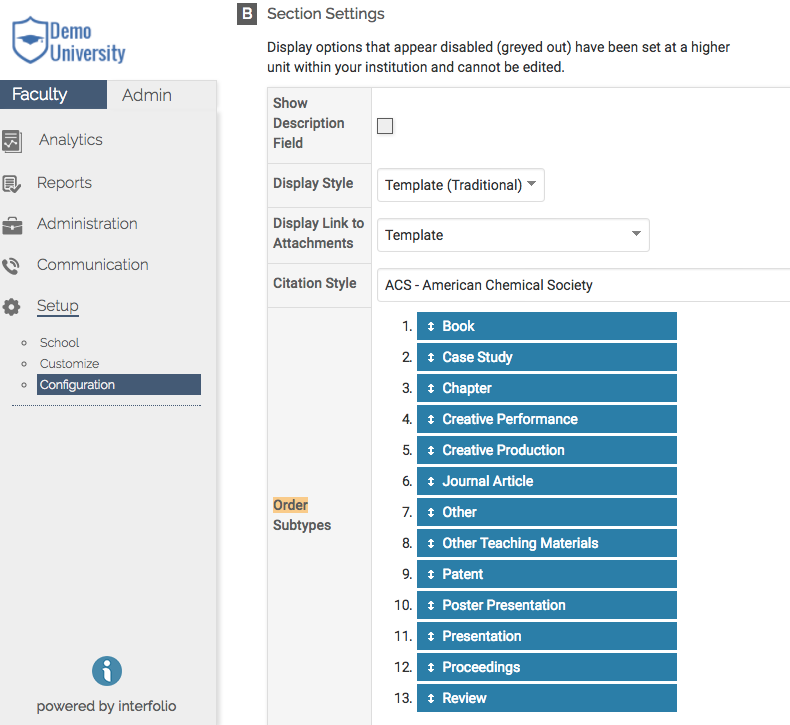 For example, if your institution has specific colleges or departments with subscriptions to external research information services, you can enable access to the integrations for only those units. If you would like to customize or change these settings, please reach out to your CSM. Section output will respect order located in Section Settings. Bug Fix: The submit button will no longer incorrectly appear on the main activities page.